Where to begin!? I only updated the weather blog 3 days ago and it was already pretty damn wet. We had 100mm of rain on Saturday (26th), then it continued rather wet on Sunday with 40mm of rain. No sun. And then Monday was a bit better, and we hoped Tuesday would improve.. only 25mm rain on Monday. Then Tuesday... I recorded 136mm of rain between 8am Tuesday and 8am Wednesday. That's wet. 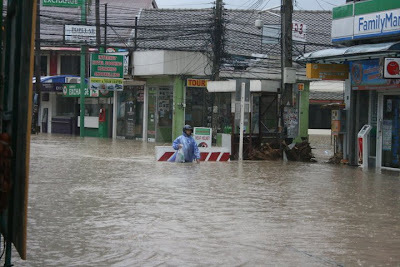 But there has been no flooding in Phuket, yeh maybe some water on the road here and there but nothing serious. Maybe the odd flooded field in the north of the island. No floods in Phuket and no damage. Airport open, no cancelled flights. And today I am happy to say, while it was not sunny, hardly any rain, winds have dropped now too. The Windguru forecast (see links top left of page) looks good, weather radar showing very little activity. I think everyone could do with some sun! Because although I say there was no damage or flooding, that's not to say that the weather has been BAD. This is now the wettest March I have known, total over 400mm of rain compared to monthly average of about 100mm. We have had some cancelled dive trips the last few days and seas were rough - people were unable to leave the Similan and Surin islands - small boats could not get back to the mainland - the Thai Navy has been bringing people back on battleships! However, some dive boats have stayed and looks like they might have much much better conditions starting tomorrow. 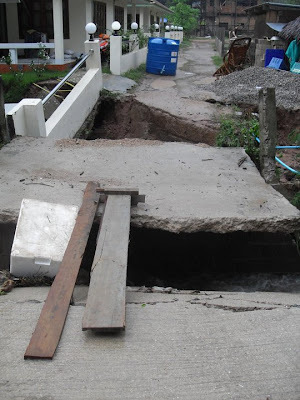 There has been lots of flooding in Koh Samui and Ko Tao on the east coast of Thailand, and floods in Nakhon Si Thammarat, Phatthalung, Surat Thani, Trang, Chumphon, Songkhla, Krabi and Phang Nga. A number of people have died due to the floods. Phuket has (again) been spared - it was the same in early November - big floods in south Thailand, but nothing much in Phuket. (above) damage in Koh Tao. Camille says things are better in Samui today, the airport has been open again, so people can move - ferries were cancelled for a couple of days, and the navy was again in action to get people from Koh Tao to the mainland. My wife and kids have been up in Chumphon (east coast) for a week or so and have been getting very bored with the rain! But they've had no flooding. This morning news came through of landslides in Krabi province, the Phuket Gazette reports 12 dead and 30 missing in a remote area. Sounds pretty bad. Meanwhile... it's a calm, dry night in Phuket. Hope to see some sun tomorrow.